If Paris is a Grande Dame, Roma is her rambunctious and unruly sister. After a week in Paris, we cannot help but compare and contrast gorgeous Paris to Bella Roma. Each city has much to love and other things that leave you shaking your head. Starting with the obvious, food. On our first trip to Italy in 2010 Ric observed “There are no bad meals in Italy; some are just better than others.” While we can attest to having had one really terrible meal in Italy in the ensuing years, we had two crappy meals in Paris in our first three 3 days and during the week some that were just meh. There is bad food in Paris. Really bad. BUT THE BAGUETTES, oh-la-la! So good and so cheap! Both Roma and Paris have pastry shops and bakeries to be proud of. Baguette versus pizza bianca? Tough choice, but I’d have to go with baguette. French croissants and pain au chocolat beat Italian cornetti IMHO. The espresso is good in Paris, but pricey by comparison to Roma where one has a God-given right to an inexpensive high-quality shot and a bar available every 300 meters where you can buy it. They do have Starbucks in Paris but I am not sure that is a good thing; we did not bother to try one. We do like the Cafes Richard brand, of course. 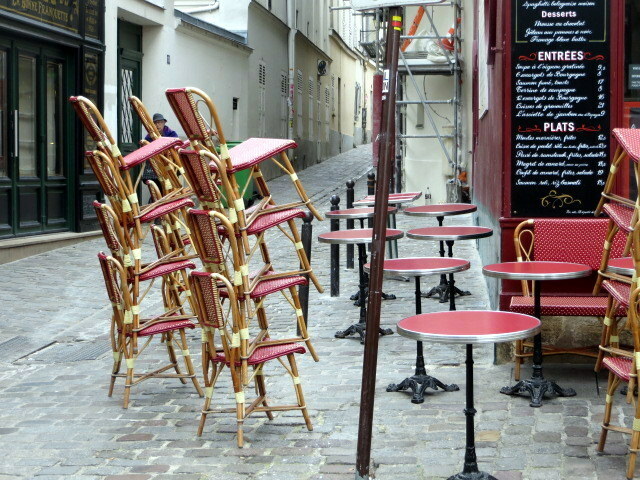 Artful stacking at a cafe in Montmarte. cut back on either. In Paris, both wine and espresso are expensive by comparison. Even house wine is quaffable in Italy, but some wine-by-the glass or carafe in Paris is, well, overpriced and barely drinkable. We have had some fantastic bottles, though one pays dearly at a restaurant. We missed the Italian tradition of serving snacks with a glass of wine at aperitivo hour. Water by the bottle, nice and sparkling if you like, is an expectation at every meal in Italy, and a litre will usually cost no more than €2.00 or 3.00. When we ordered bottled water in Paris we were hit with a €6.00-7.00 price! However tap water, ordered only by una brutta figura in Italy, is gladly handed out in a carafe in Paris. Free is a very good price. It was quiet at Versailles the day we went. Only customers in garden cafe. We did have Boeuf Bourguignon that was practically life-changing. Served with a mountain of mashed potatoes, it was in a little oven-pot in a rich wine sauce heavily laced with bay leaves and bacon. We ate it with good French red wine and hunks of baguette. It was a good thing we had walked about 13 km that day! Quality vegetables beyond salads have been harder to find when dining out. In Italy there are fabulous contorni to be had that are not starchy and white. In fact I am craving a plate of cicoria ripassata now. There’s no bakery chain in Italy like Paul’s in France. And I agree, Laurel, I had some pretty bad food in France – but also in Firenze. Paul’s was great for an “institution!” We will go back… in spring…maybe 2016! Joyeux Anniversaire! Yes, Paris is lovely but spendy….no matter what the exchange! But Spain – at least outside of the big cities, and maybe off-season- is quite a bargain right now! And the panaderías have some wonderful offerings! Merci Susan! I have heard Spain is very affordable. Hope you are having soem sun! Ok Laurel, now you need to go to Barcelona and compare the three! When I was there the food was fabulous and very inexpensive compared to both Rome and Paris. 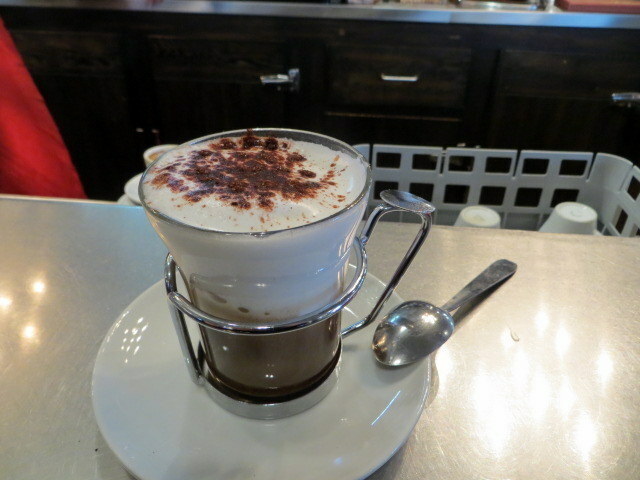 you also get your cafe in a bar, and many have a menu del dia with a starter, main dish, dessert and wine included. Hi Karen! Great idea! We need to figure out when/how to fit Spain into all of our travel plans! Thank you for the names of the restaurants. We try to get up there at least once during the year, so will try them out. Sometimes we get to apartment sit for friends, which we love to do. That means we can eat better than when we have to pay for hotels. You look cold in your photos. We are sweltering here in California so are not looking forward to our return to France in April. It does give us two springs however, which we love. Thanks Chloe! Hope you enjoy then as much as we did! Just what are these restaurants? We could give them our vote of confidence when next we are there. 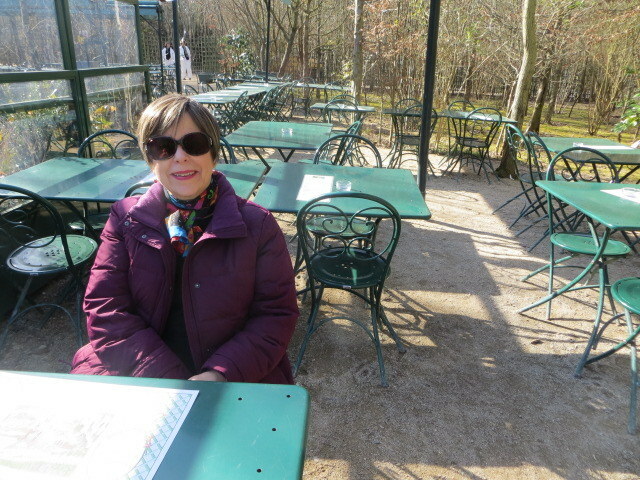 Les Papilles, close to the Luxembourg Gardens, fixed price meal, set menu, no choices. It’s a “cave du vin” so you select your wine off the wall (which can be expensive). We had a FABULOUS meal. Reservations in advance. In Montmarte we had life-changing Boeuf Bourguignon at a hole-in-the-wall called Cave La Gourmande. It is very unprepossessing as a location, but the boeuf! Wow! Also had a superb warm goat cheese salad. The best French food I ever ate were the homemade meals by my French host mom – simple and wonderful. Also, guess where they lived? Right on the Italian border! Coincidence??? Bonjour Maron! We had did have that absolutely fabulous meal of Boeuf Bourguignon which overall is simple: stew with attitude! Have a fun trip! Several years ago one of our granddaughters was visiting us in France. While she was there, we took her several places in Europe, including Rome. When she returned home, her parents asked her what she enjoyed the most in France and her answer was, “Rome.” She has been able to return to her favorite city several times since then and her answer remains the same. I love Paris, but have to agree with you about the food. My suggestion to anyone who goes there is to try to find regional restaurants, those that serve food from certain regions of France. If you do that you can usually get a good meal and one that is reasonably priced, at least for Paris. I have never found a good Italian restaurant in France. As here, they try to make Italian food too complicated; they just can’t believe that good food can be so simply made. At least Paris is beautiful and can be visited for that. Great story Chloe! We found two places that are “go backs” and we will go back! For now I am happy to be home with my Nespresso machine.